Most people have an arch along the inner side of the foot, leaving a gap between the ground and the foot. Some feet have a higher arch than average. This is the opposite of a flatfoot. In combination with a higher arch, the ankle may be "rolled" outwards slightly - this is the opposite of a pronated foot. Often this gets referred to as pes cavus. When standing with weight on the foot, the arch will appear higher. 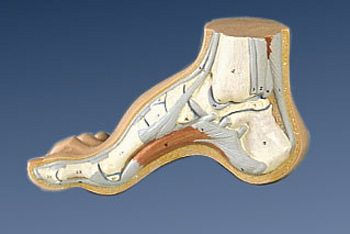 The heel often tilted inwards at the ankle (but not always). In many the toes will appeared clawed. When not standing the front half of the foot (forefoot) will appear to be dropped below the level of the rearfoot. High arch feet may just be a normal variant (ie some people just have higher arches), some may be hereditary (ie runs in the family) and in some cases there may be an underlying neurological problem that is causing it. * there may be corns and calluses under the bases of the first and fifth toes. * Shoe may not fit very well because of the high arch and the clawed toes. * There may be some pain in the arch area, because of the pressure that it is under. * The feet will feel stiffer and less mobile than a foot that does not have a high arch. * An ankle sprain are more common in those with a high arched foot. This will depend on what is causing the pain, if anything. Initially a careful investigation is needed to rule out any neurological condition is causing the high arched foot. The use of foot orthotics or insoles to support and protect the foot and relieve pressure areas. * If corns and callus are present, they can be treated by a Podiatrist. * Proper fitting of footwear is important. In very sever cases, especially if pain is present and the height of the arch is progressively increasing in height, surgery may be considered. Just diagnosed yesterday and given a corticosteroid shot in my heel. It was painful but only for about 2 seconds. But 30 mins later I was hurting from my foot to my thigh for about 30 mins. I was instructed to do some exercises with my foot before getting out of bed and another exercise after I get out of bed and put ice on my heel for 20 minutes a few times a day. I also got some shoe inserts to see if they help. The shoe inserts seem to be helping! The shot must have helped. My heel doesn't hurt like it did! !